"Bollinger bands (BB) consist of three lines - upper, middle and lower band. The middle band is the moving average line which acts as a trend indicator. The upper and lower bands are a measure of volatility determining upside and downside of the trend." The distance between these bands widen with large volatile price movements and narrow during small price changes. When the stock breaks through the upper band (resistance level), Buy signal is generated. When the stock breaks through the lower band (support level), Sell signal is generated. However, if prices immediately move back inside the band, then the suggested signal is negated. In the above 30 min chart of MCX crude oil, BBs tighten with sideways movement in price indicating period of low volatility. A Buy signal is then generated with prices crossing and closing above the upper band and followed by a big rally upwards. 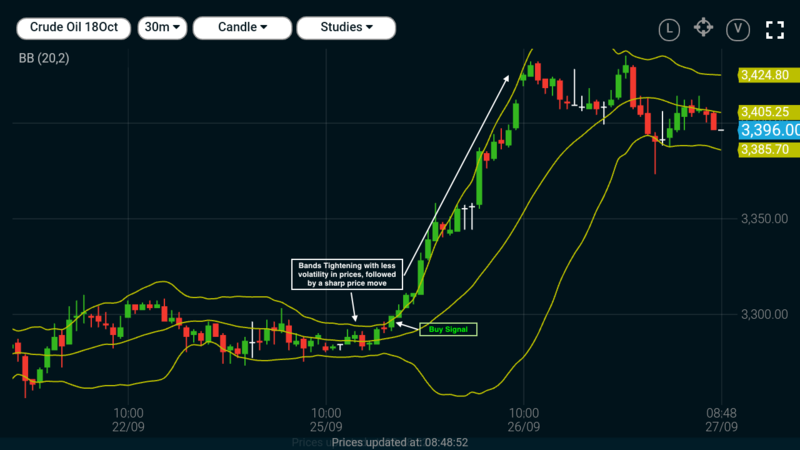 When the price is in strong uptrend, it touches or runs along the upper band during impulse waves higher. If the price fails to do that it implies that uptrend may be losing its momentum. During an uptrend at certain period of times prices will drop, this is called pullbacks. If the price is moving up strongly then the pullback lows will typically occur near or above the middle band. If the pullback stalls near the middle line, it shows buying strength. 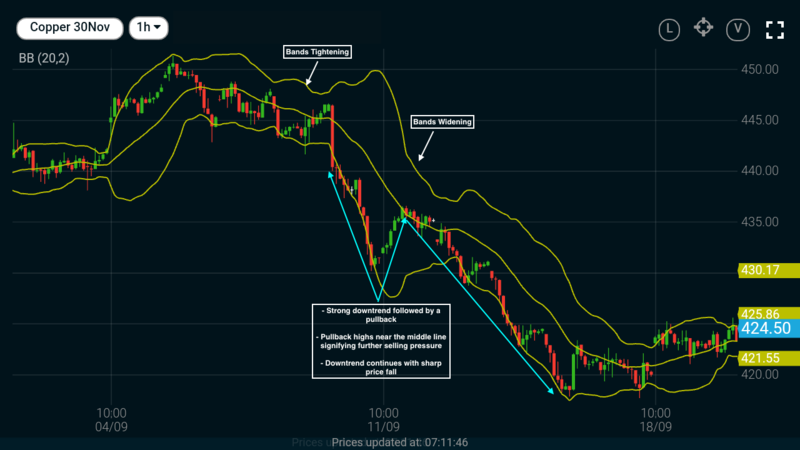 When the price is in a strong downtrend it will typically touch or run along the lower band during impulse waves lower. When it fails to do that it shows the downtrend may be losing momentum. During a downtrend at certain period of times prices may rise, this is called pullbacks. If the price is moving down strongly then the pullback highs will typically occur near or below the middle band. If the pullback stalls the prices near the middle line, it shows selling strength. In the above 1 hour chart of MCX copper, we see a downtrend in prices followed by a pullback. The pullback makes a high near the middle line which signifies further strength in the downtrend. As indicated in the chart, downtrend continues and pullback is followed by a further fall in prices. If the price is in an uptrend, and continuously hitting the upper band (and not the lower band), when the price hits the lower band it could signal that a reversal has commenced. If the price rallies again, it is likely it won't be able to reach the upper band or the recent price high. If the price is in downtrend and continuously hitting the lower band (and not the upper band), when the price hits the upper band it could signal that a reversal has commenced. If the price declines again, it is likely it won't be able to reach the lower band or the recent price low. बॉलिंजर बैंड का प्रयोग कैसे करें? बोलिन्जर बैंड कैसे काम करता है?